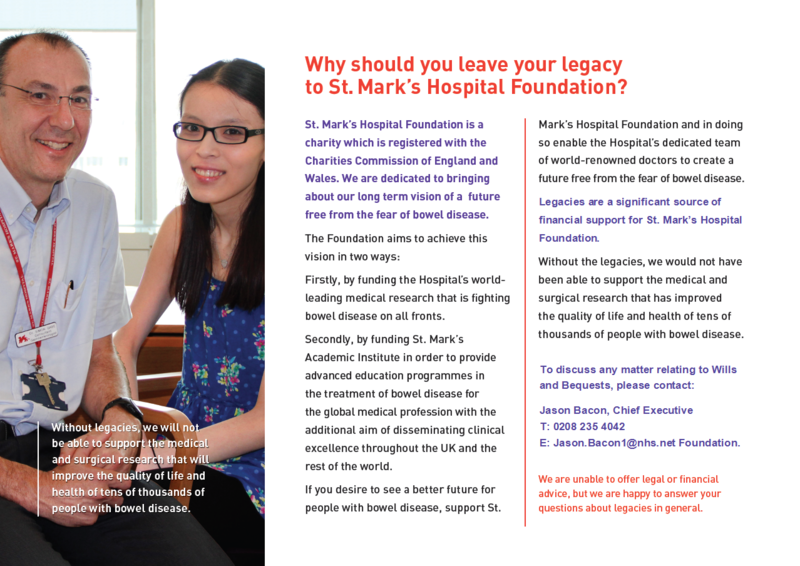 A gift in your will to St. Mark’s Hospital Foundation is a lasting way to help many people living with bowel disease. Legacies not only help save lives, but they save lives while restoring the quality of life and long term health of people with severe bowel disease. The research that legacies help fund allows St Mark’s to push the frontiers of treatment, enabling our dedicated clinicians to treat highly complex bowel disease more effectively and provide new treatments for previously untreatable conditions. Legacies have already restored the health of tens of thousands of people with debilitating and life-threatening bowel disease. If you wish to see a better future for people with bowel disease, support St Mark’s Hospital Foundation and thus enable the Hospital’s dedicated team of world-renowned doctors to create a future free from the fear of bowel disease.